Commercial use of nanoparticles (NPs) is increasing rapidly. There is concern that their unique physicochemical properties could cause toxicity, but testing is complicated by the fact that there are a very large number of NPs being invented, with varied materials, sizes, shapes, and surface modifications. To save others the potential effort of replicating toxicologically uninteresting results, we report that with the exception of silver (Ag) NPs, most that we have tested have been essentially nontoxic to C. elegans under laboratory conditions except at very high concentrations. 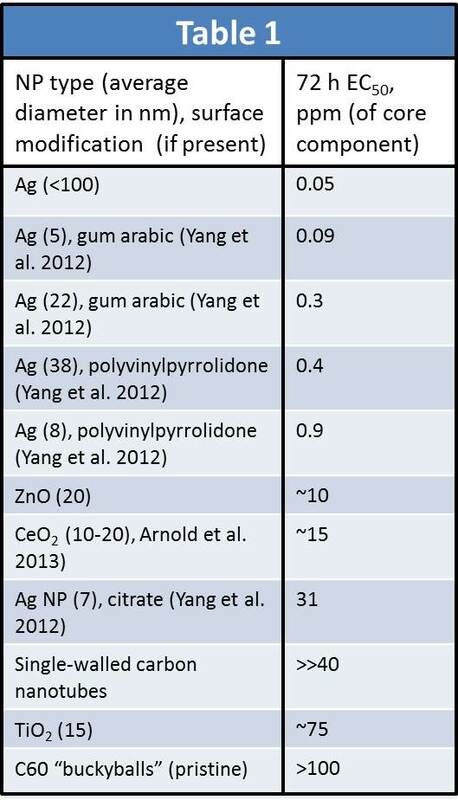 We compare the toxicity of NPs that are only toxic at high concentrations to values for AgNPs that we have published on (Yang et al. 2012; Arnold et al. 2013), because they are more toxic. Toxicity was tested either as inhibition of larval growth, or survival of young adults. Exposures were carried out in moderately hard reconstituted (“EPA”) water, as described (Maurer et al. 2015). We present NPs rank-ordered for toxicity (Table 1; most toxic at top), based on inhibition of growth of L1 larvae over 72 h. EC50 (concentration that reduced growth by 50%) values, with one exception, were 10-1000x lower for AgNPs than other NPs. We found the same general result when assessing young adult survival (young adults are generally more resistant to NPs than larvae (Zhao et al. 2013; Choi et al. 2014)), with some of the same and some different NPs. 24 h LC50 (concentration that kills 50%) values were: uncoated and polyvinylpyrrolidone-coated Ag NPs (sizes in Table 1), between 0.04 and 3.3 ppm; 34 nm citrate-tannic acid-coated AgNPs, 3.5 ppm; 29 nm citrate-glutamate-coated AgNPs, 1.4 ppm; 40 nm CuONPs, 10-30 nm ZnONPs, 20-30 nm FeONPs, 15 nm citrate-coated AuNPs, 10 x 40 nm rutile TiO2NPs, and 10-30 nm rutile TiO2NPs, > 100 ppm. This is not a comprehensive analysis of NP toxicity. For example, environmental conditions can alter NP toxicity: sunlight can greatly increase, and sulfidation, organic matter and other factors decrease, toxicity (Maurer et al. 2015; Zhao et al. 2013; Choi et al. 2014). It is also possible that longer-term and subtler health impacts of NPs, or effects on organs absent in C. elegans (e.g., lungs), will be important. Yang X, Gondikas AP, Marinakos SM, Auffan M, Liu J, Hsu-Kim H, et al. (2012). Mechanism of silver nanoparticle toxicity is dependent on dissolved silver and surface coating in Caenorhabditis elegans. Environ. Sci. Technol. 46, 1119-1127. Arnold MC, Badireddy AR, Wiesner MR, Di Giulio RT, Meyer JN. (2013). Cerium oxide nanoparticles are more toxic than equimolar bulk cerium oxide in Caenorhabditis elegans. Arch. Environ. Contam. Toxicol. 65, 224-233. Maurer LL, Ryde IT, Yang X, Meyer JN. (2015). Caenorhabditis elegans as a Model for Toxic Effects of Nanoparticles: Lethality, Growth, and Reproduction. Curr. Protoc. Toxicol. 66, 20 10 21-20 10 25. Zhao YL, Wu QL, Li YP, Wang DY. (2013). Translocation, transfer, and in vivo safety evaluation of engineered nanomaterials in the non-mammalian alternative toxicity assay model of nematode Caenorhabditis elegans. Rsc. Adv. 3, 5741-5757. Choi J, Tsyusko OV, Unrine JM, Chatterjee N, Ahn JM, Yang XY, Thornton BL, Ryde IT, Starnes D, Meyer JN. (2014). A micro-sized model for the in vivo study of nanoparticle toxicity: what has Caenorhabditis elegans taught us? Environ. Chem. 11, 227-246.